S100 Motorcycle Carnauba Paste Wax protects and enhances motorcycle paint. Made with carnauba wax and beeswax. No chalky residue to stain trim. Pure wax with no cleaners. S100 Motorcycle Carnauba Paste Wax gives the painted areas of your motorcycle a shine as bright as the polished chrome pipes. Just like a car wax, S100 Motorcycle Carnauba Paste Wax protects paint from the elements and keeps it slick and glossy. 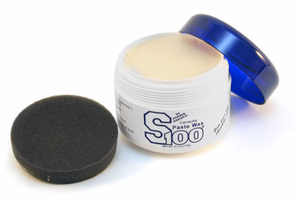 S100 Motorcycle Carnauba Paste Wax is loaded with real carnauba wax and beeswax. These two waxes provide excellent protection from moisture, UV rays, and contamination. The high grade carnauba provides a slick, reflective shine. For the best results, prep the paint with S100 Shine Enhancing Cleanser. Then apply S100 Motorcycle Carnauba Paste Wax using a foam applicator. Buff with a microfiber towel. S100 Motorcycle Carnauba Paste Wax does not stain most rubber and plastic trim. Make your motorcycle's paint stand out with S100 Motorcycle Carnauba Paste Wax. I heard a lot about this wax so I purchased to give it a try. I've heard its very similar to P21S. Goes on very easy, similar to PBMG waxes in that you can wipe off before it dries, which quickens the application process. It wipes off very easy this way (compared to letting it dry, which is not how it is intended). I've used it on both a silver metallic and a black vehicle. The silver metallic glistened. The black became deep and rich. Overall a very solid wax for lights or darks. It also has exceptional beading, which I understand may be due to beeswax which doesn't have protective properties, but it sure makes water roll off. ProsAppearance on lights and darks, ease of application, beading, price. ConsLongevity, although this is expected for a boutique wax. No points deducted. Good wax. Also good for cars. I purchased this wax instead of P21s because it seems to be the same exact wax, just named differently. Regardless of whether it's a motorcycle wax of a car wax the stuff is really good. 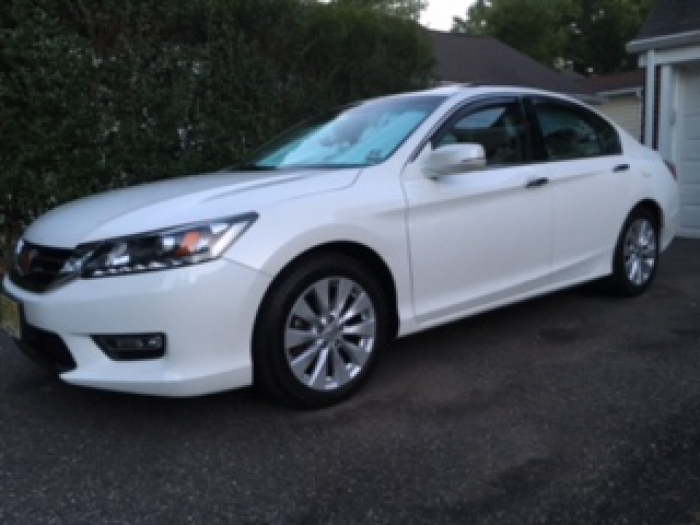 I have a white '13 Accord and after washing and waxing my car looked great. I did not clay bar this time as I had in early May of this year, but after using this wax I was very happy. I am becoming somewhat of a wax collector and I am glad that I added this wax to my collection. Will eventually get me some P21s just so I can say that I tried it, but if you are on the fence on getting either one of these waxes, give S100 a try. I am sure that you will not be disappointed. ProsEasy on easy off. Very smooth. Goes on like butter and comes off really nice. I did not let it sit for too long. I started on the trunk and by the time I made my way around the spot where I started was ready to be buffed. I did not have extremely high expectations for this wax when I purchased it because of the price. I knew it was going to be decent, but had no idea it was going to be as good as it is. The packaging is very professional and informative. It is a softer paste wax that builds up very easily on a foam applicator pad, allowing you to do larger sections at a time should you choose. It buffs off easy enough. It does not really have a smell, but the smell it does have isn't good or bad. The container says it has enough for 25 applications, but I think it can go further than that. For the price and the purpose, I don't think there's a better wax! It'll make your bike shine and bring out metallic flake if you have any! Also works great on chrome/stainless steel! ConsNone other than to be careful around rubber/plastic trim in case the wax stains it - I do not know if it does and I'm not going to test and find out!